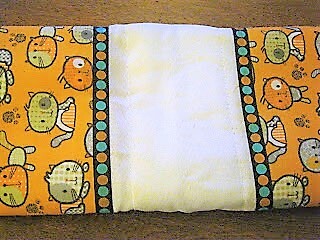 These cute burp cloths are easy to make and so cute to give as gifts. Now, as I always tell you, I do not get along with sewing machines. For some reason, I just don't have the talent to work with them. So these little cloths would be very simple to stitch together for you sewing machine "get alongers". I am sure it would only take a few minutes to whip up. This version is for those of us who desire to create cute things and need a way around the sewing machine issue. One thing to note though about this version. 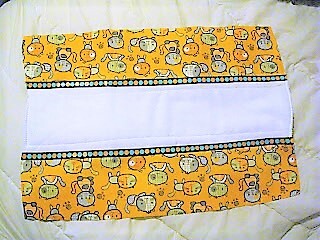 Because we will be using an iron on fusible webbing (such as Wonder Under) to create these, the sides of the burp cloth with the cute printed fabric will be a bit stiffer than if you sewed them. but that should not deter you. We will use the ultra light webbing instead of the heavy and that will help some too. Ok. Lets get started. This will make 2 cloths. 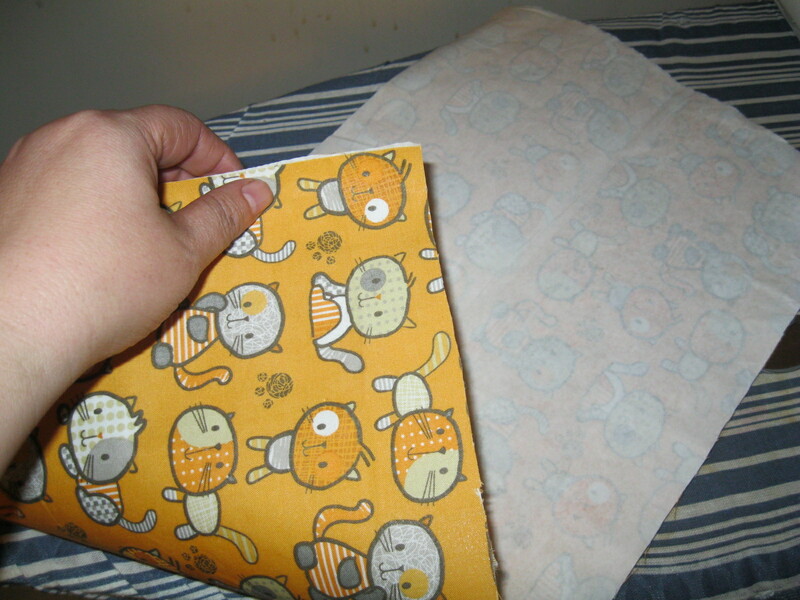 *1 "fat quarter " of fabric: this will be enough material for two burp cloths. (fat quarters come pre-cut in the section that has precut quilt squares. They are 18x 24" ). Mine was .97 cents at Walmart fabric dep't. *Iron on fusible webbing : Get the ultra light if possible over the heavy duty (I used Wonder Under brand. You can buy this in prepackages or most craft stores carry it by the bolt and you can have cut just what you need. You will need enough to do your fabric quarter as well as your ribbon. *Option: For the ribbon, they also make the wonder under in small ribbon sized strips on small rolls. It's often used as hem tape for no sew hemming. This will save you from trimming the ribbon off of the wonder under once you've fused it. but you don't have to do this. 1) Iron your fabric so that it is completely crease free. 2) Follow the instructions on the fusible webbing to iron on the fusible web to the back side of your fabric. 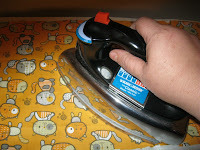 Usually after you've ironed the material completely, you turn it over right side down and place the fusible web on top of the fabric paper side up. 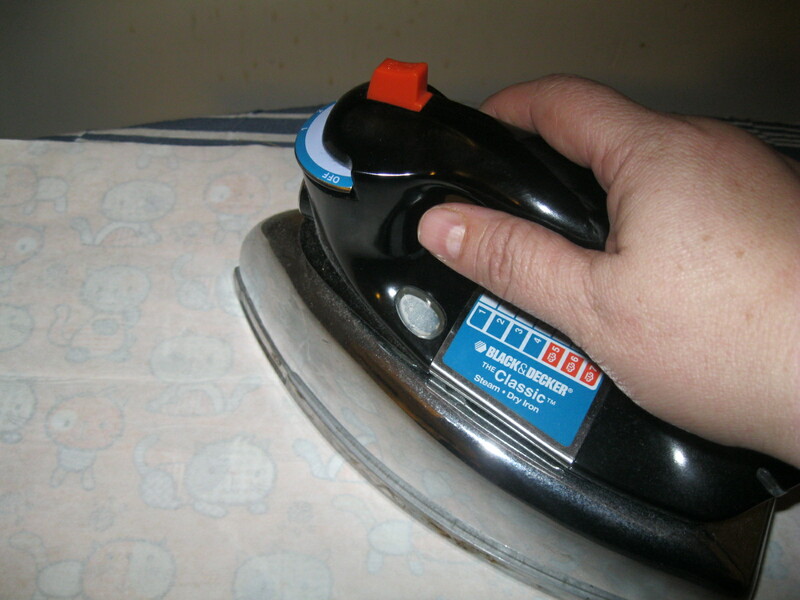 this means the right side of your material is face down and the paper side of the fusible web is on top so the iron will glide over the paper side, adhereing the back of the fabric to the webbing side of the fusible web. 3) You should now have the entire fat quarter of material ironed on to the fusible web, so the material has a paper backing on it. 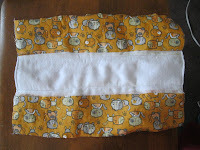 Fold the 18x24 inch fabric in half so that it is now 9x24 inches. Open the fabric and cut the fabric along the fold line so you now have two 9x24 inch pieces. 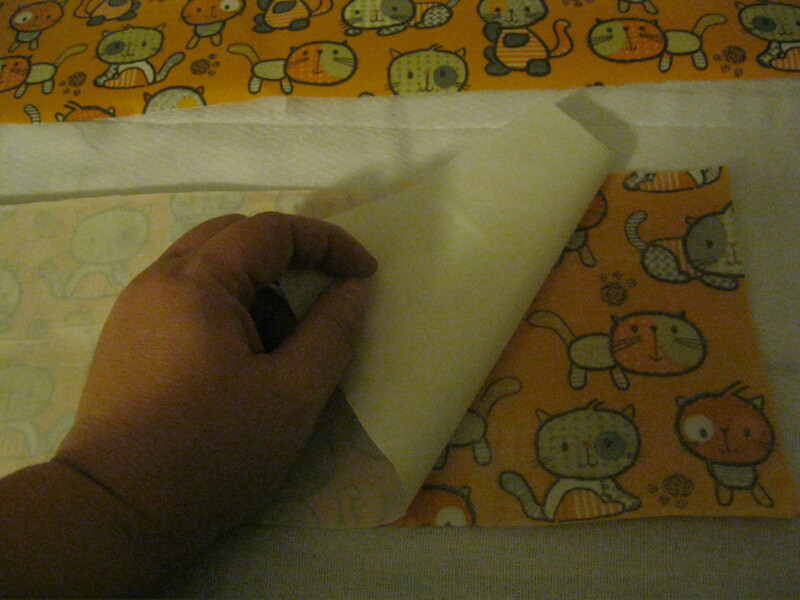 Now fold each 9x 24 inch piece in half again so you have a 4 1/2 x 24 inch piece and cut along the fold line. This will give you a total of 4 long fabric pieces. You will use two strips for one burp cloth and you will have two more for a second one. 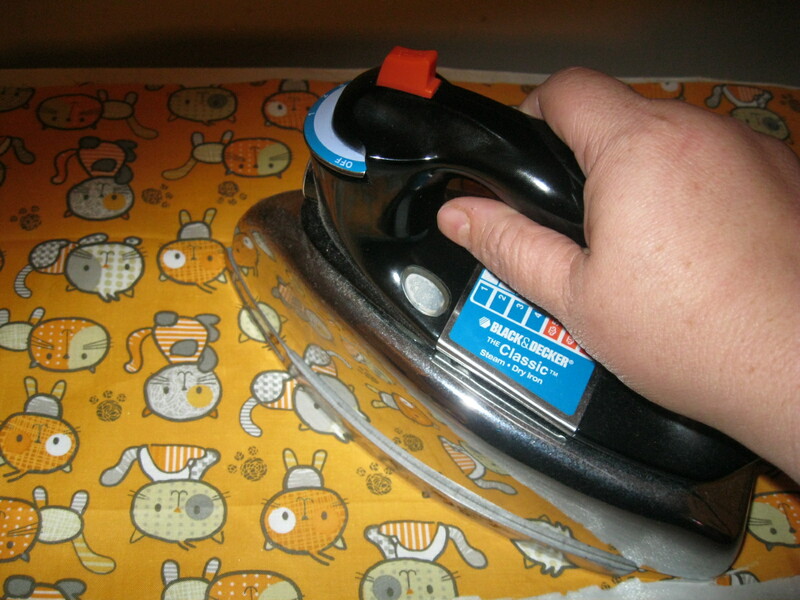 4) Iron the diaper so it is as crease free as possible. Carefully peel off the paper backing on one strip of fabric. 5) Place fabric along one edge of diaper and following fusible webbing instructions iron the fabric onto the diaper. Repeat for other side of diaper. 6) Set burp cloth aside and attach the ribbon to the fusible webbing by following the instructions in step 2, like you did for the fabric. You can either use the skinny hem tape type of fusible webbing or just the regular webbing and cut out the ribbon on each side of the ribbon from the webbing so that you now have a paper backed ribbon. Cut the ribbon into two 24 inch pieces. 7) Peel off the paper backing on one of the ribbon strips and place it along the inside edge where your printed fabric ends. Iron the ribbon onto the burp cloth per instructions from the fusible webbing. and repeat process on other side. Your finished cloth should look like this!